In June 2016, the Register trip covered around 1800 miles on some of the best twisty and hilly small roads from Caen in France to Santander in Spain, via several beautiful national parks and the Pyrenees from east to west. We returned to UK on the ferry from Santander. Below are some pictures taken along the route. 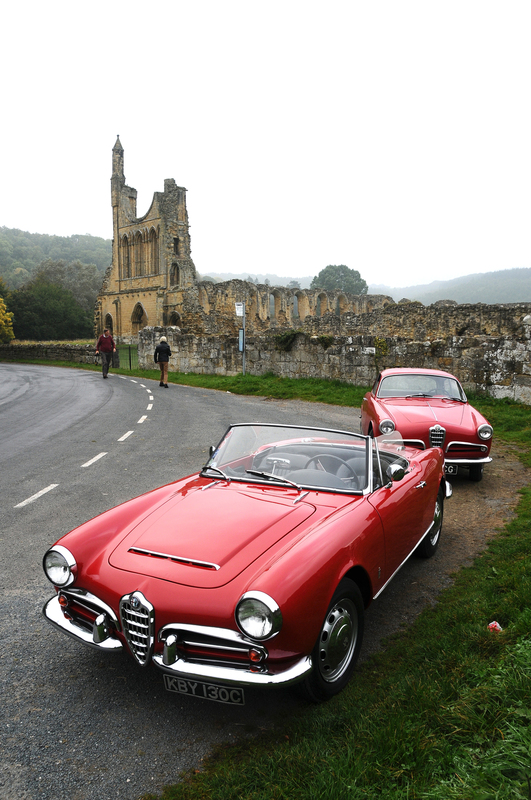 The Sherborne Castle Classics and Supercars Event in Dorset, England, on Sunday, 17 July proved a great venue for the Giulietta Register’s Summer get together. Vintage, veteran and classic cars filled the gently rolling lawns surrounding Sherborne Castle. A delightful array of classics, predominantly British, provoked warm nostalgia in so many of us wandering their polished ranks. Pre-WWI and ‘specials’ leviathan racers thrilled onlookers as their huge motors (some aircraft engines!) were each started and gently revved to an informative commentary. Modern Lamborghinis, McLarens and Ferraris competed for hearts not already lost to the older iron. The Register’s pitch was in a prime position and the line-up of Giuliettas and Giulias was a novel and popular display. Register members enjoyed meeting each other again - some cars and their owners who had not been seen at Register events for some time and some new members with their beautiful cars, original and restored, new to the Register and to the UK. Having greeted each other, parked with precision, assembled and positioned the club banner, and optimistically applied sun block, we set about exploring Sherborne, seeking out the loos and coffee stalls on the way to the different car club stands, trade stands of model cars, useful and cheap tools, and auto jumble stuff. Possible vantage points were scouted should the promised later arrival of the squadrons of modern ‘supercars’ prove tempting. It was all a pleasantly manageable size, well catered and with an atmosphere of calm enjoyment reflecting good event organisation. Sherborne Castle is often referred to as Sherborne New Castle to distinguish it from Sherborne Old Castle. The Old Castle is a ruin of a 12th C castle built by the Normans at the time of William the Conqueror. By the time Elizabeth I reigned it was already a ruin. Sir Walter Raleigh, a favourite of the Queen, apparently loved the place (and it’s easy to see why) and Elizabeth leased the estate to him. Rather than rebuild the old castle, Sir Walter built a relatively modest four-storey ‘lodge’ in the grounds for his occasional visits. After Walt lost his head, subsequent incumbents enlarged the buildings adding new wings, but it was severely damaged in 1645 in the Civil War. Rebuilt, it took on the Sherborne Castle moniker, though it really is more a large Jacobean house rather than a fortified castle, as we see today, but actually still pretty old. Soon enough we all found themselves back at our Giulietta line-up and set about drawing the folding chairs and travel rugs into an ever more elongated picnic circle. The threatening sky delivered a heavy but short downpour prompting hasty erection of hoods, but soon cleared to blue with sunshine for the rest of the day. The picnic was a relaxed, disorganised and hugely enjoyable get together with old friends catching up and new friendships started. Cars were discussed and minor modifications inspected. 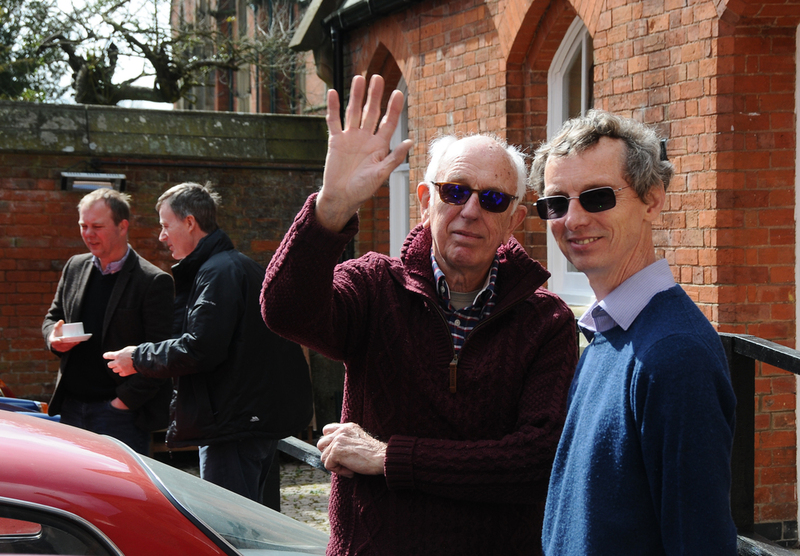 Register Chairman, Richard Wigley, continued the light-hearted tradition of announcing fun prizes, awarded only after rigorously superficial scrutiny and secret judging of the cars on show. Doug Whitaker took Best 750 Spider. Best 101 Sprint went to David Roberts, and Phil Gibson’s Spider was recognised as Best New Restoration (even though it was parked opposite with the Wessex Italian Car Club group). Tamara Earley was awarded the coveted Overall Best Car prize for her lovely and very original white Sprint which she recently acquired in Sweden. The car has a fascinating history which hopefully Tamara will be willing to recount in a future article for this magazine. The socialising continued long after the lunching ended and it was late afternoon before the first cars were packed and headed for home through the beautiful green and rolling hills of the Dorset countryside. It had been another most successful Register event superbly organised by Tony and Jane Ives, whom we thank again, and well supported and thoroughly enjoyed by all those Register members participating. In 2010 we dallied in the fresh autumnal air of the Yorkshire Dales. Five years later we were back for moor – the Yorkshire Moors that is. For those of us who hail from the crowded south, it is hard to believe that such a seemingly vast, empty landscape, tree-less, unbroken and bleak can exist in this small country, England. In fact the Moors cover less area than Greater London but there they are, around 450metres above sea level, carpeted in heather and bracken turning brown in early October, harbouring delightful small towns and villages, and criss-crossed by narrow, near-deserted roads so beloved of Giulietta drivers. The unpretentious and friendly Worsley Arms Hotel in Hovingham was our base for the two nights of our three day trip. Nineteen of us in 10 Giuliettas and Giulias were joined on our drives by Howard and Jacqui Bryan, and Paul and Jane Wignall who live nearby. They recommended the delightful figure-of-eight route centred on Hovingham, taking in the marvellous ruins of Rievaulx Abbey, the lively market town of Hemsley, the mist-shrouded white horse hill carving near Kilburn, the old railway yards and steam trains at Grosmont, wine tasting at Ryedale Vineyards, and much moor in between. It was great to have Don and Lynda Sanders from North Carolina, USA joining the party again having also been on the trip to Germany in June and the Italy trip in 2014. 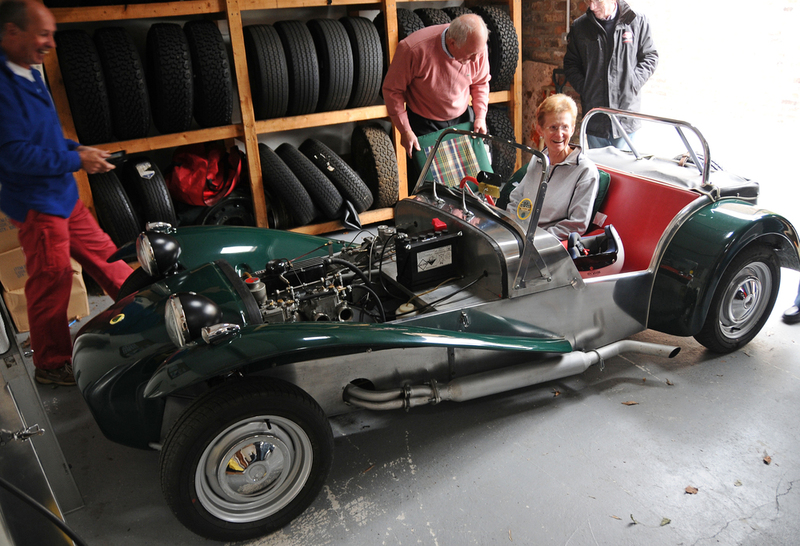 We enjoyed meeting Martin and Liz Hunter with their beautifully prepared dark blue Sprint and hearing about their eclectic collection of classics, and it was good to see Ken Hammond back with his exquisite early Sprint with an unfortunate 2 litre transplant now happily replaced by the original rebuilt 1300 cc motor. As for the rest, it was the “usual suspects” kicking tyres and catching up – Duncan and Bridget, Stuart and Jan, Paul and Kate, Julian and Stephanie, Peter and Marianne, Richard and Jackie, and of course Tony and Jane whose flawless organisation ensured everyone had a great weekend. Many thanks to Tony and Jane, to Paul and Jane for the brilliant routes, and to Howard for inviting us to see his big box of well-used toys. On a wet morning we drove from Sussex to Bovington in Dorset as the rain got ever heavier. When we arrived there was a forlorn Sprint parked on its own in the reserved parking area. New member David Roberts had driven down from Rugby on the Saturday in fine weather. Richard and Jackie, and Don and Eithne in their Spiders also drove down on the Saturday. Graham Earl turned up in his Sprint, Peter Yaxley was in his Berlina, and Andrew Stevens was with his Dad, over from Australia, in the 1750GTV. Tim Wilson joined in his Sprint GT. The rest of us were in “moderns” but at least mine was an Alfa. Richard Wigley marshalled us in the cafeteria ready for the guided tour and gave us a potted history of the Museum and the current collections. Richard is on the board of Trustees and acted as one of our guides for the visit. We split into two groups. Our tour leader had spent 35 years in the tank regiment and knew all there was to know about the subject; he was even able to answer young Cameron Hampton’s probing questions. We learned that tanks were brought into service in order to be able to straddle the trenches, and that the Mark one tank, known as Little Willie, right there in front of us all, was the prototype for all British WW1 tanks. It had a similar power output to a Spider Veloce and a top speed of just 3.5 mph. In 1917, Renault produced a tank with a fully rotating gun turret, a great improvement operationally. The German Tiger tank from WW2 was a magnificent piece of machinery, all welded, heavy and surprisingly modern in appearance, whereas the equivalent mass produced Russian tank was lighter and more maneuverable. We were told that Russian tank crews were chosen on height to allow the machine to have a smaller profile. Makes sense. The modern tanks, just as superbly displayed, are, of course, much faster,we were assured, and have computer controlled gun aiming although we are told that the British military prefer not to use this feature and retain manual control of firing. 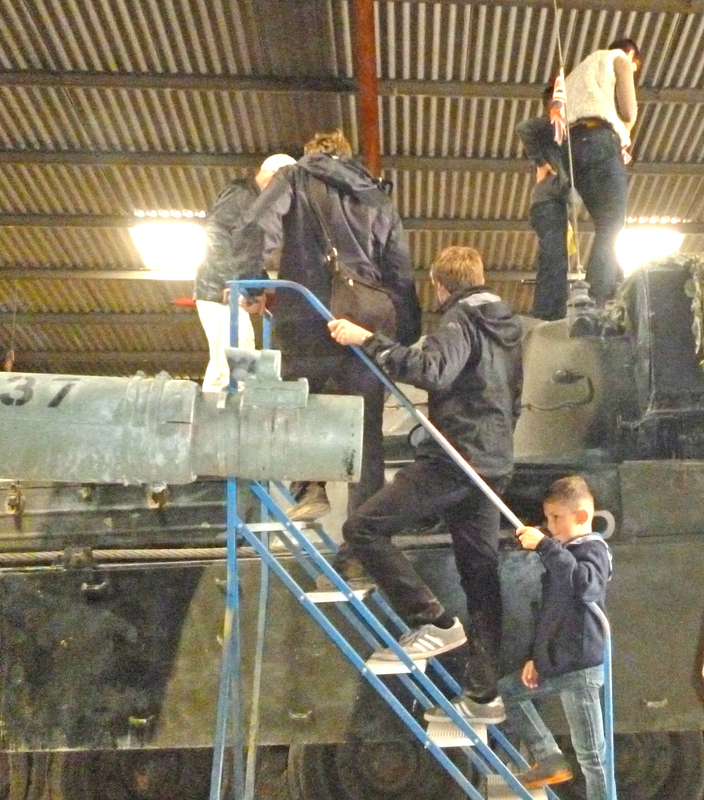 My impression of tanks in general was that they weren’t very nice places to work in, cramped, full of diesel fumes, recoil from the guns and difficult to see out of. After lunch a visit to the “work in progress sheds” was organised where those with shoes “unsuitable” for the very wet and very muddy conditions realised the error of their ways. 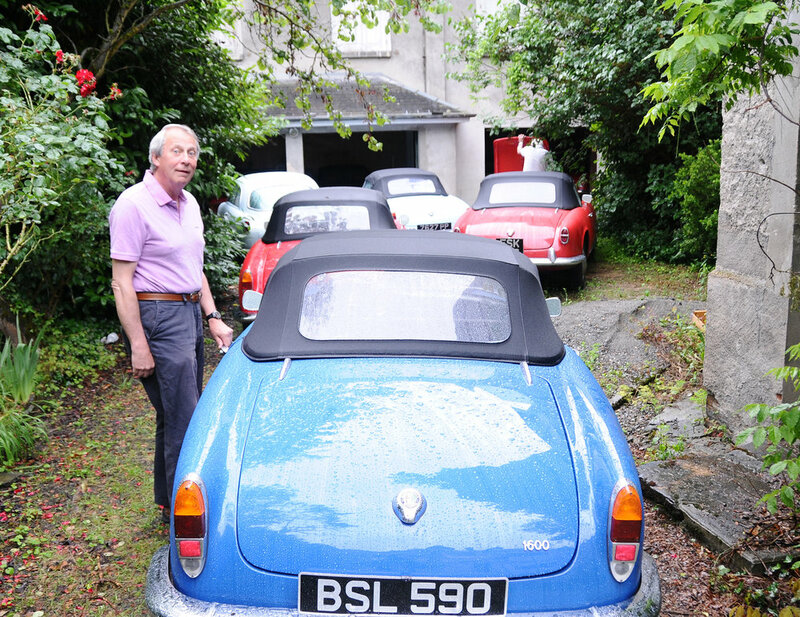 On the way over to this part of the museum, David Roberts discovered the joys of Giulietta motoring when he found he had a flat battery and needed a push start in the pouring rain before setting off back home. All in 24 people came along including Paul and Kate Gregory on their wedding anniversary! They were off for a slap up meal on their way home. Many thanks Richard for organising another great Register event. Americans Brad and Sherry Baum and Don and Lynda Sanders, from California and North Carolina respectively, joined the Register trip from England to Friedrichshafen in Germany from 11 - 17 June 2015. You can read below Brad's daily blogs sent from the road. We had a beautiful drive on Thursday, our first day! The first hour or so away from the Chateau Barive was over narrow farm roads with good pavement, past rolling crop fields, going south of Sainte Preuve toward the A26, north of Reims. Red poppies grew along the edge of the road in spots, and a blue and a yellow Giulia Spider filled my windscreen. Sherry was beaming next to me, listening to her iPod, pointing out small animals, and waving at our Alfa driving friends. Jackie turned around in her seat to take pictures at one point, and we thought of Rod Mossop doing the same a few years back in the French Alps. After a couple hours of busy motorway, we drove more small roads through forest covered hills. From that point on the temperatures were short sleeve warm all the way to the hotel in Bad Herrenalb in Sud Schwarzwald. The Mercedes Museum is just what you would expect from Mercedes. It was a very special to have our Alfas park at the museum entrance in a wide pedestrian apron. The history of the motorcar from its very beginning (with the Merc point of view), products in non -passenger car applications, common autos, and of course, the silver arrows, and recent GP cars are all there with the best presentation, and detailed information. Easily my favorite was the pre 60's race car collection. All the racers produced prior to the tragic Le Mans accident are beautifully detailed engineering works. They appear robust, and still light, not at all my long held perception of Mercedes. After a few hours at Mercedes, the drive south to Friedrichshafen was work at first. Open roads were only a couple of kilometers between villages it seemed for over an hour. After that, at most, 10 km between development, or towns, but the roads started to sweep left and right just matched to a Giulia's handling and light steering. The farm and forest scenery was all you could ask for. This weekend was my second visit to Klassikweld Bodensee. Obviously, I like it. I like it a lot. Today, I even like it more than the Monterey Classic week. First, the distances are short. I watched race cars standing ten feet from the edge of the circuit, studying various race lines and braking points, watching great passing and tactics. Without moving position, then I watched a B24 in polished aluminum, and the only flying P38 I've ever seen taxi past for demonstration flights. Three minutes walk and you're among a vast assortment of collector cars, or you can buy a beer and food. The venue is also just a few minutes from our hotel, which is near shops, great dining, the Bodensee lake shore, and the Graf Zeppelin museum; all are minutes walk. Also, everything is much cheaper than the Monterey peninsula. But, most of all this event has the motor vehicles that I crave to see. MV Agusta had an impressive presence among a few hundred great old motorcycles. Affectionados of many European makes had club stands, as well as the spectator car park, restored caravans, wooden boats, and several great old airplanes. For any Motörhead, nothing's been left out! Leaving Friedrichshafen in gentle rain, I looked forward to the short drive along the lake shore to the ferry boat landing at Meersburg. The reality was a closed motorway diverted all traffic through small town roads and we only traveled at walking speed, with a delay of well over an hour. Then in Switzerland, motorway travel was quick enough, but not too interesting until, after a few hours drive, the exit near Oensingen toward Naturepark Thai. This new small road became more interesting mile by mile and at the French border we stopped for coffee in a beautiful setting at the small village of Goumois. From there to Besancon we drove the best small driving roads and scenery you could hope for, all the way to Hotel Le Sauvage in Besancon. Set in a beautiful medieval village, the River le Doubs flows around the old town on three sides. The old citadel is prominent above our room window. Besancon and Goumois are places I'm going to return to! Sometimes driving on a Register tour, I'm reminded of the film sequence from The Italian Job, where Mini Coopers are rushing through narrow streets in Torino. That was the feeling when leaving the beautiful Hotel Le Sauvage in old Besancon. Its great fun to quickly travel narrow, or one way medieval roads round the old buildings with the hood down, listening to echoing Alfa engines and waving at enthusiastic spectators. It feels like we're hooning through an otherwise peaceful place, and if in modern cars a reprimand or worse would be issued by locals. Leaving Besancon, the route was perfect Giulietta driving roads for many hours. More sweeping corners on two lane roads through beautiful farmland, with a lot of river and canal crossings. Deciding a picnic stop by a rivers edge would be nice, finding a spot was easy. By early afternoon, I thought I've never had a more perfect drive in a sports car. Hotel Moulin-Babet in Mezy Moulin is a simple and pleasant accommodation in a beautiful setting. 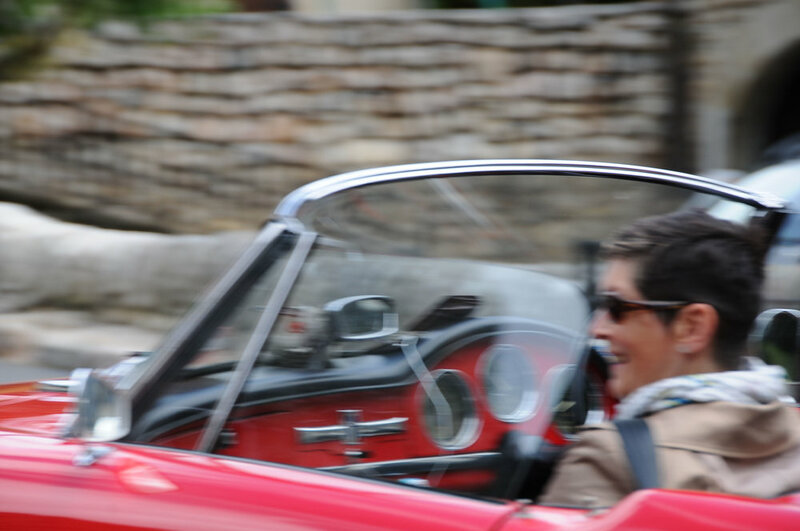 This would be my last chance, after breakfast, to inspect Frank Van Der Vecht's beautifully restored 57 Spider. My own 57 Spider came to me partially disassembled, and missing a few critical small items. Frank's help this morning filled all my gaps, in knowledge as well as parts inventory! After a few pleasant miles on small roads, then the A4, we're on the A26 motorway to the Eurotunnel. I've driven this stretch of A26 more than half a dozen times. Low stress motorway lets your mind wonder. For me, that means pondering place names along the way. St Quentin is a milestone town along Hwy 1 in Baja California. I always contrast that dry simple desert town to the lush productive farm land around this French St Quentin. Then Arras, it's been more than twenty years since I read Saint-Exupery's account of a recon flight to Arras. As I pass by, I wish I could recall more of the story. Someday, I will take the off ramp to N17 and visit the grass airfield there. I've always received warm welcomes when visiting small airfields anywhere in the world. Then Blockhaus Epperlecques has a large road sign on the A26. Thanks to Richard Hampton, I know exactly what's at this historic WWII landmark. Not that long now, until signs for the Eurotunnel entrance. The very best sport touring I can imagine is the motoring I've done with the Giulietta Register over the past ten years. It's great to have terrific friends who share my passion for these wonderful cars. A chilly day for hood-down driving did not deter Register members from attending the Annual General Meeting on Sunday 19 April. Some 14 Giuliettas and Giulias, five slightly newer Alfas, a Fiat Barchetta, a Ferrari, and a modern sofa (BMW) brought another good turnout. Some 35 members, spouses and friends formally reviewed the past year, kicked-off the Register programme for 2015, and lunched together. Wroxall Abbey in Warwickshire proved an excellent venue with a delightful outside courtyard for the parking parade and an even more spacious ex school classroom which could have comfortably accommodated three times our number. Several members had enjoyed a delicious dinner and convivial imbibing the evening before in the Wroxall Abbey Hotel. This was the second AGM to be preceded by a dinner together and a sleepover the night before and judging from its popularity, it looks like the start of a tradition. 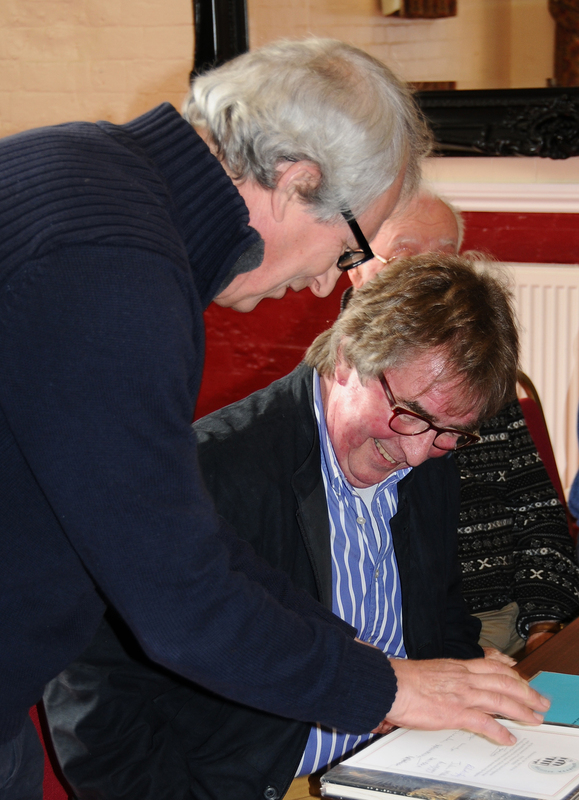 This was the first AGM under the chairmanship of Richard Wigley and it was quickly clear that administratively he is as well tuned and finely fettled as his gloriously prepared blue Spider. The formal business of the AGM was quickly despatched with apologies recorded, the financial accounts approved and all Committee members re-elected by acclaim and to the relief of the other members present. Richard’s 2014 Chairman’s Report began with thanks to his predecessor, Paul Gregory whose seven years as chairman was reflected in the good health and success of the Club today. “Our main measures of success are membership levels, financial security, reaching out to and sharing information with members worldwide, and organising enjoyable and interesting events for members to participate in.” he said. On all these measures 2014 proved to be a good year for the Register. The level of membership had held up well, numbering over 400, less than 10% down on the previous year. A small increase in the subscription had resulted in a modest increase in the Club’s revenue and reserves. Reminding members that the Giuliettaletta continued to be the main point of contact with members worldwide, the Chairman reported that he and the Editor, Don MacLean, had agreed specific new objectives for the magazine. The number or articles from overseas members would be increased to better represent their interests. Following feedback from members, the ‘Letta would seek to provide a regular flow of high quality technical and historical articles as well as reporting on relevant events. The latest ‘Lettas were evidence of this change with articles contributed by members in the USA, New Zealand, South Africa, The Netherlands, France and Madeira, articles on restoration projects and a new series of Chairman’s interviews. Richard briefly recapped on the Register events enjoyed by members in the 2014 Programme: the April AGM at Abingdon; the long-awaited and spectacular 60th anniversary trip to the Vernasca Silver Flag hill climb near Parma, Italy, in June; the summer picnic at the Shuttleworth Collection of vintage and veteran planes in a graceful flying display near Biggleswade in July; and the Autumn long weekend in splendid mid-Wales. He warmly thanked all Committee members, whose great organisation and voluntary hard work had made the Programme so enjoyable, the management robust, and the Club successful. His thanks were echoed in the loud applause from all members present. In the informal part of the meeting, Peter Yaxley expanded on membership, reporting that numbers for 2015 were slightly down on this time last year but that his direct follow-ups with members who had not yet paid were eliciting renewals. Even so, a slight reduction in membership numbers was expected. It was suggested that this may be in part due to the rapid increase in the value of the cars perhaps leading to a change in the ownership profile with more cars going into collections rather than being driven regularly. Simple inertia may be a reason too and the possibility inviting UK members to pay their subscription by direct debit, together with a membership drive were mooted. Some fluctuation in membership from year to year is not unusual but the numbers would continue to be monitored closely. 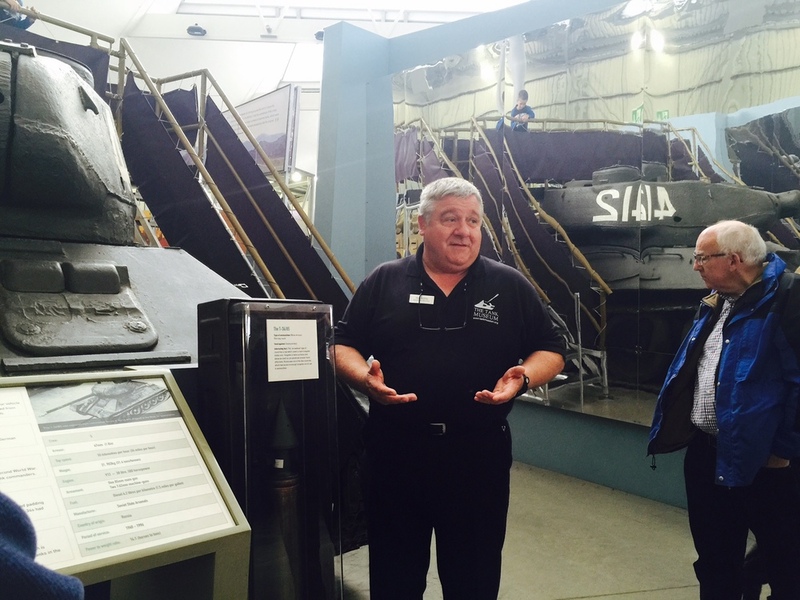 Tony Ives (UK Events) outlined the UK programme with the summer event being held at the Tank Museum at Bovington in Dorset on Sunday 26 July. There are over 300 vehicles in the museum including the first-ever tank. The collection is regarded as the best in the world, and Register members will be taken behind the scenes to tour the workshop and areas not usually open to the public. Admission prices are £11 per person or £5 for OAPs and children. Those intending to join this event will be asked to pay in advance in order that numbers can be advised to the Museum well ahead of the visit. A notice will be put in the next ‘Letta and on the website giving details of how to register and pay. The other UK event is the autumn tour of the North Yorkshire Moors on Friday 2 October to Sunday 4 October. It will start with lunch together and a scenic drive to the hotel on Friday, choice of driving or cultural options on Saturday. Sunday will include a visit to a Register member’s car collection near York followed by lunch and departure. Tony has reserved 15 rooms at the hotel which those intending to go on the trip will have to book before mid-August. Further details will be in the next ‘Letta and on the website. Richard Hampton (European Tour) reported that interest had been expressed for 11 cars to join the trip to Germany taking in the Klassikwelt-Bodensee Show at Friedrichschafen commencing on 10 June and returning to UK on 17 June. Some others would be joining the tour just for the weekend of 13-14 June. Richard was concerned that the show organisers were not responding to his emails. Paul Morris volunteered to ask a friend in Germany to make contact in German in Richard’s behalf. The arrangements were perhaps less advanced that he had hoped by this stage but organisation was now in hand. The varied terrain on the route promised fantastic but less arduous driving than many experienced on last year’s trip to Vernasca. Don MacLean, Giuliettaletta Editor, thanked all those members who had written articles and contributed photographs for the ‘Lettas and renewed his annual plea for existing authors and new writers to keep sending him such interesting material and great pictures. Don announced that the winner of the prestigious Elsie Smith Trophy for most significant contribution to the Giuliettaletta was Greig Smith (no relation) in South Africa whose encyclopaedic knowledge of all things Giulietta were legendary. Paul Gregory accepted the Trophy from Alan Smith on Greig’s behalf and read a message from Greig. As the Trophy was too large to send, instead a model of a blue Sprint with a small engraved plaque would be sent to Greig in South Africa. Peter Bradnock, who has taken on responsibility for the website, reported that site visits averaged 1025 per month and page visits 3020 per month over the last 12 months with relatively little monthly variation. His aim was to make the website clearer to read with more timely and useful information, but he would still be relying on James Wiseman’s technical expertise for the tricky bits. The advertisements pages were popular and more advertisements for cars and parts for sale or wanted would draw more visits. He encouraged members to dig out those old parts others may want to buy. Members were asked to look at the website and to let Peter have ideas about what kind of material they would find useful. He reminded the meeting that there is a password protected Members section which needs to be repopulated following the unfortunate hacking problem experienced early last year. Technical articles previously published in the ‘Letta could helpfully be placed in the Members as a reference repository for members. However, a way needed to be found to bring the website to members via social media such as Facebook. Perhaps a member could write a daily blog from the Germany trip for the website? Before closing the meeting, Richard Wigley announced the winner of the Chairman’s Award in recognition of someone who has given exemplary service to the Giulietta Register and its members. This year he presented the Award to joint winners, Jane and Tony Ives who have worked tirelessly for the Club and contributed so much to the organisation and success of its activities. Their dedication to the aims of the Register, their perfectionist attention to detail, ready willingness to help others in the group, and their infectious enthusiasm for Giuliettas, made Jane and Tony popular and deserved recipients of this Award. How is it we did not know about Wales? Sure, the names of the towns were mostly beyond pronunciation by our linguistically impoverished band, and we expected the sheep and some rain, but the beauty and sheer emptiness of the countryside, and the exciting variety of the roads, enjoyed largely without other traffic, were a revelation. The friendly hospitality of the Hotel Metropole at Llandidrod Wells, our base for the nights of 3 and 4 October, crowned an exhilarating driving experience and a hugely enjoyable weekend for the 10 cars that made the Register’s Autumn sortie to Mid Wales in October. Sadly Paul and Kate had to pull out en-route due to a dodgy distributor but the rest of us encountered no problems. We met at the welcoming Wellington Country Pub in the village of Wellington near Hereford and, after a hearty lunch, set off together for Llandidrod Wells on a circuitous route taking in the tops of the Black Mountains. The Hotel Metropole is a grand old Victorian hotel still in private ownership, and a favorite with car clubs. 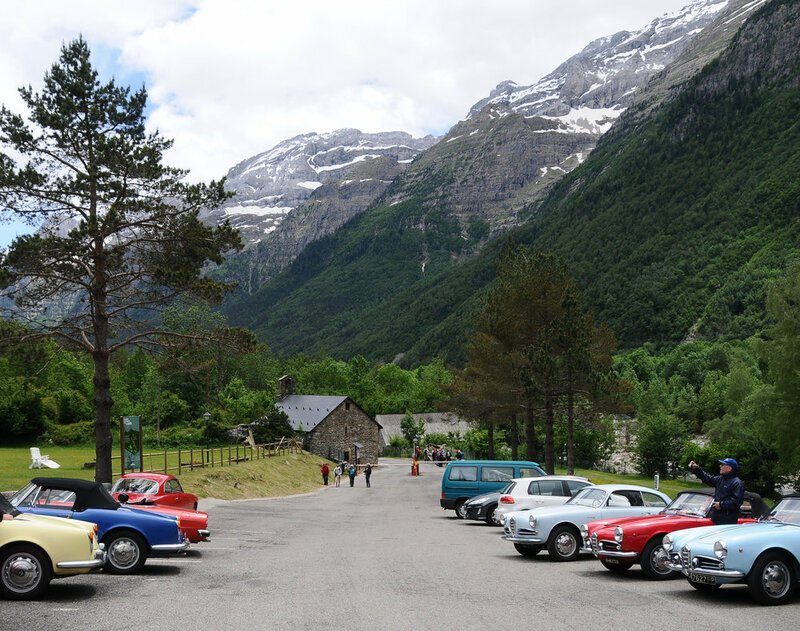 It was bustling with guests, including the splendidly turned-out Maserati Owners Club, a large and fun group of motorcyclists on tour, groups of walkers, and a wedding party. Rain in the night cleared by morning and, hoods down, we headed out to discover the wonderful scenery and delightful rural roads of Mid-Wales, including the challenging Devil’s Staircase and the beautiful Elan Valley and reservoir, with diversions to see red kites feeding at a sanctuary near Rhaydar, and the perilous descent on foot at Three Bridges to see spectacular waterfalls. The Metropole looked after us well in every way. Our dinners, with specially printed menus, were served in a private dining room adorned with the old Victorian splendor. 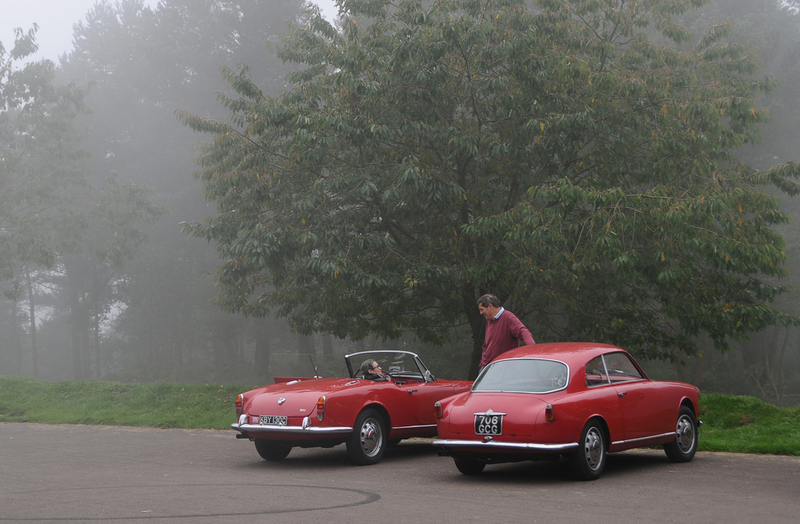 We lingered too long over the generous breakfasts at tables reserved specially for the Giulietta Register. Sunday saw us sauntering across country to a delicious lunch with top class cooking at the renowned Harp Inn at Old Radnor, near Presteigne, before heading off into gathering rain on our separate routes for home. Grateful thanks to Tony and Jane Ives, whose excellent organisation opened our eyes to wonderful Mid Wales. Thanks also to Paul Wignall, Richard Wigley and the MGA Register for helpful route suggestions. It was perfect flying weather at the Shuttleworth Wings & Wheels Airshow at Old Warden on Sunday 27 July and a perfect event for the Giulietta Register Summer picnic. Around thirty Register members, families, and friends marvelled at the languid flying displays of vintage planes and gliders from the Edwardian era up to WW II and wandered round the open hangars of the museum. Sixteen Giuliettas were lined up for inspection and a little recreational fettling around a delicious and free lunch individually boxed and universally enjoyed. Register members and other visitors were pleased that Paul Gregory decided to bring his newly-completed and gorgeous 1933 8C 2300 for close examination and much admiration. Joseph Shuttleworth, a wealthy industrialist, bought the estate of thousands of acres of Bedfordshire farmland, a mansion,and the village of Old Warden from the heirless and impecunious Lord Robert Ongley in the late 19th century. Included was a fabulously eccentric and folly-filled “Swiss Garden” created by Lord Ongley. The gardens were later totally neglected but largely intact, until finally being painstakingly restored in the last few years and re-opened to the public only the day after the Register Summer picnic. The world famous aviation museum is part of a trust created by Dorothy Shuttleworth in memory of her son Richard, a farmer, racing driver and aviator who died in a second world war air accident in 1940. The collection includes many unique examples of airworthy vintage planes as well as aero engines and a small number of very early motor cars, motor bikes and cycles. The Shuttleworth Collection is a delightful journey from flimsy contraptions of wood, wire, treated paper, and tiny lumps of oily cast iron, through to the sleek designs and sophisticated engines and propellers of commercial and fighting aircraft of WW II. Some are static displays but most are regularly flown by very brave enthusiasts to the delight of the public who come to this charming and curiously tranquil place. Another great Register get together, and well worth another visit. Thanks go to Tony and Jane Ives for organising the event and to Jackie Wigley for the lunch arrangements.